A tea that many coffee drinkers like is roasted oolong. It shares some similar characteristics with coffee, such as nuttiness with a rich body. And just like coffee, how long the tea is roasted will greatly influence its taste. Last year I decided to experiment with roasting my own oolong tea. After all, I’ve been home roasting coffee since 1998. Why not roast tea as well? 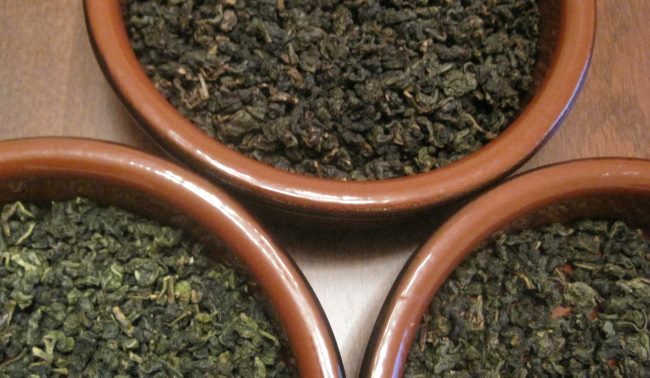 This tea’s oxidation is stopped somewhere between the standards for green tea and black tea. The processing typically takes two to three days from withering to drying with a relatively short oxidation period of several hours. The oxidation percentage of oolong tea can be low or high. The lower oxidized teas tend to be brighter and the higher oxidized ones have a richer body which is closer to black teas. Many tea drinkers, myself included, gravitate towards oolongs. We love the different flavors and fragrances typically not found in green and black teas. That is the basic explanation of oolongs. I’ve added some links in the reference section below for those wishing to learn more. 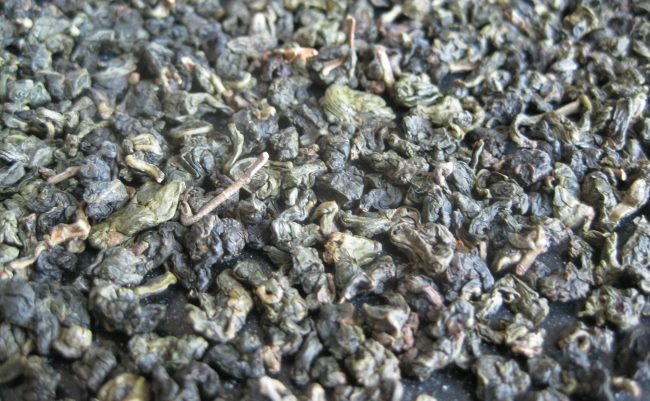 Oolong teas like other perishable items can go stale over time and lose flavor. Tea can also absorb the odors that surround them if stored improperly. If a tea started with a good flavor and has gone flat, a short lower temperature roast can bring it back to life. This is called refreshing the tea. Although each tea will vary depending on its age and oxidation level, a basic refresh recipe is to roast the tea in the oven at 200 F for 20 minutes. One thing I learned is that as wonderful as the refresh technique is, you can’t bring back to life a tea that is too stale or never had a great flavor to begin with it. Once the refresh portion is complete, you can proceed into the roast. This involves slowly increasing the temperature. How long you roast the tea is up to you. If you like the “roasty” flavor, take the roast longer. I like to find the balance between the bright characteristics of the oolong and the toasty flavors that develop during the roast. 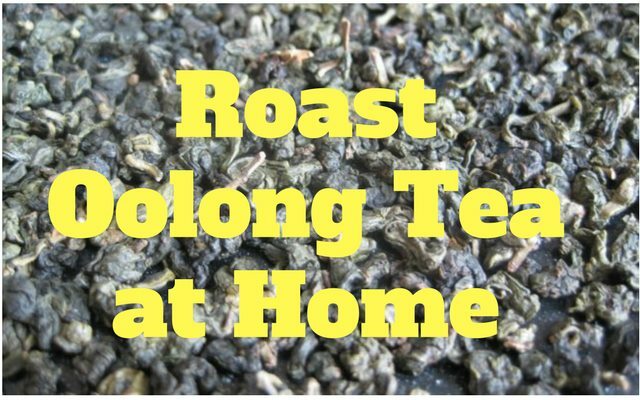 All you need to roast oolong tea at home is an oven, cookie sheet, and some oolong tea. To get started, I recommend using a lighter affordable oolong, such as a Jade oolong. Starting from something light and bright and moving toward a darker toasty tea will highlight the differences you will get during the roasting process. During the roast, it is perfectly acceptable to pull out tea at different points and brew it up. In fact, I encourage you to do that. During the roast, I will pull the tea out of the oven a few times and give it stir so the roasting is even. A typical oolong roast profile will start with a low temperature which gradually increases. 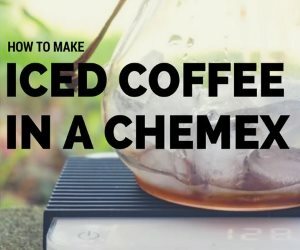 If you have experience home roasting coffee, my advice is to relax and be patient. Roasting tea takes much longer than coffee. When I first started roasting I focused too much on creating an optimal temperature profile. Because every tea is different, it is better to learn to focus on color and smell. By the way, the smell of roasting oolong tea is amazing. Pull samples during the roast and brew. You’ll learn quickly how roasty you like your tea and if you under-roast something, you can always roast it longer later. In the table above there are 3 roast profiles (A, B, C) that I used for my Jade Oolong. Your times will most likely be different depending on the oolong you roast, your oven, and your own personal taste preference. The way to use the table is to start at the first row and work down the table adjusting the temperature for the specified amount of time. With each step, the temperature is increased. Don’t forget to periodically pull the tea out of the oven and stir. This will ensure the roast is even. This was my setup for determining tea roast profiles. Just like with home coffee roasting, if one really wants to explore this hobby, you can buy a dedicated tea roaster. I know some tea shops that have their own mini bamboo tea roasters. They do a better job than oven roasting, but a cookie sheet is fine if you are roasting small batches of tea. The mini tea roasters are best for larger volumes done at tea shops. Also, if you are a tea roaster and have some additional tips and advice, please leave a comment below. Coffee is still our first love at INeedCoffee, but a lot of us love our sister beverage almost as much. Your guidance is appreciated. What is Oxidation? 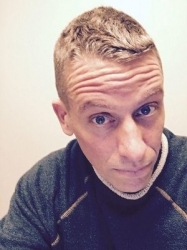 – Article by Tony Gebely explaining tea oxidation. Oolong – Wikipedia page on Oolong tea. Does an excellent job highlighting the different types of oolongs and their different fragrances. Tea Processing – Wikipedia page. 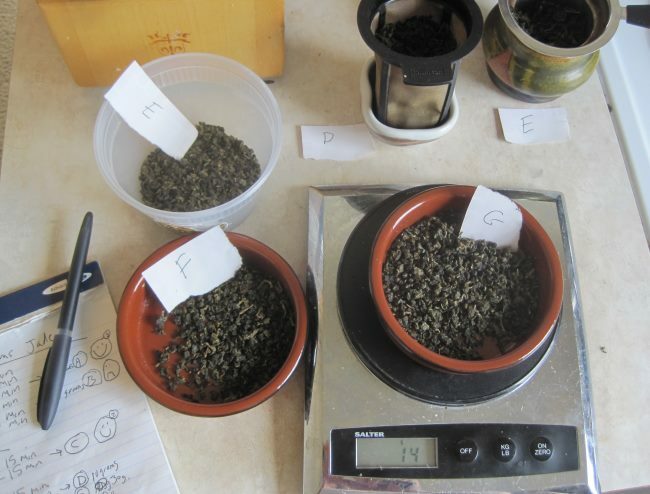 Miro Tea – While experimenting with roasting oolong I received guidance from my local tea shop Miro Tea. They hosted a few tastings of my roasts. I used the tasting notes to improve my roast profiles.